They saved her from demolition. So when is the adaptive reuse going to happen? She is Our Lady of Loreto, the shut-down Catholic church at 124 Sackman St. in the Ocean Hill section of Brownsville. She was built a century ago as a place of spiritual refuge for the area’s Italian immigrants. They are a coalition of Brownsville community leaders and preservation-minded Italian-Americans who were instrumental in stopping the planned demolition of Our Lady of Loreto as part of a low-income housing development in 2010. The housing was constructed, with fewer units than originally planned, alongside the church building. The neoclassical Roman Renaissance-style cast-stone church designed by Italian immigrant architect Adriano Armezzani was spared. Our Lady of Loreto still stands silent and empty — nearly three years after responses were due for a Request For Proposals (RFP) for its renovation and reuse. 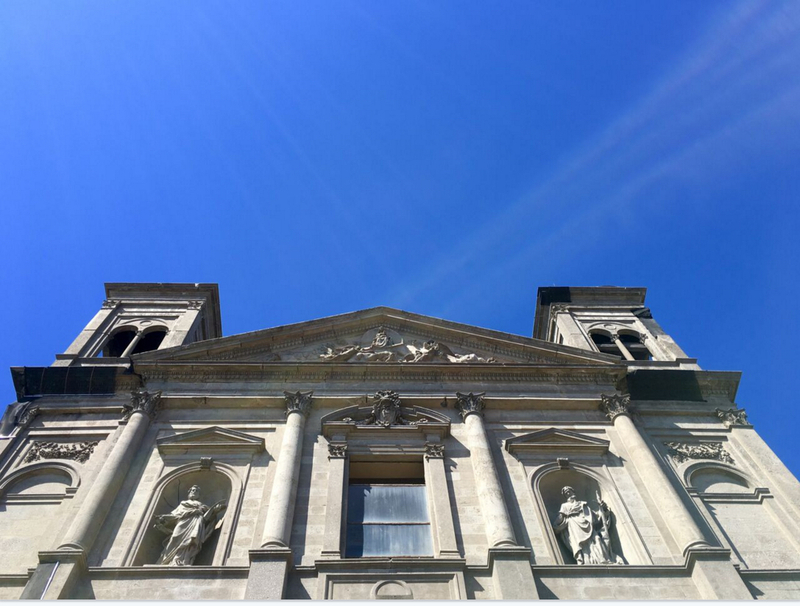 The RFP was issued by the Catholic Charities of Brooklyn and Queens subsidiary that’s leasing Our Lady of Loreto Church’s building for 53 years, with an option to extend the lease to a 99-year term. There are no renovation or adaptive reuse plans to be found in city Buildings Department records. The charitable organization did not respond to a query of ours by deadline. The RFP called for a developer to sublease the church building and adaptively reuse it “a community facility and/or residential units” — and said applicants could submit proposals for new construction if they showed adaptive reuse was not feasible. Activists who want Our Lady of Loreto to be turned into a cultural center worry about what use will ultimately be made of the long-vacant church. “With gentrification coming into the neighborhood, I’m afraid we residents may not have much to do with it,” Miriam Robertson, executive director of Brownsville Heritage House, told the Brooklyn Eagle. “We want this to be our vision,” she said. The late Patricia Deans, Brownsville Heritage House’s previous executive director, was a leader of the successful effort to halt our Lady of Loreto’s demolition. She died in 2013. To honor Deans, Robertson’s organization and other grassroots groups are going to campaign for the landmarking of the church building as well as its adaptive reuse. “I am taking up the fight for her,” said Robertson, who collected signatures for Deans’ save-the-church petitions when Robertson was a Brownsville Heritage House board member. The neighborhood organizations are collaborating with longtime Italian-American supporters of Our Lady of Loreto. They include Mario Toglia, who’s a researcher for the Committee to Save Our Lady of Loreto Church, and Louis J. Gallo Jr., the New York State chairman of the Commission for Social Justice, the anti-defamation arm of the Order Sons of Italy in America. With its ample size, and its proximity to Long Island Railroad’s East New York station, the church building could become a multicultural facility drawing audiences from Long Island to Downtown Brooklyn. “It could be a mini-BAM,” Robertson said. Lakai Worrell’s organization Purelements: An Evolution in Dance needs performance space, Robertson said. Les Ford’s NIA Theatrical Production Company could stage plays in the refurbished church building. The group has performed at Brownsville Heritage House. Its space, on the second floor of Brownsville’s Stone Avenue Library, has room for just 70 to 75 seats. There could be jazz recitals like the ones Brownsville Heritage House hosts. The church basement could be used for pottery, dance, photography and other arts classes. Italian immigrants built the church as a refuge from discrimination by Catholics of other ethnicities, especially those of Irish and German descent. “They literally segregated Italians in the churches, in the basement or the back of the church,” Gallo, the Commission for Social Justice leader, told the Eagle. The dedication ceremony for Our Lady of Loreto took place in April 1908. In recent decades, when Italian-Americans mostly moved away from the area, the church served a largely Hispanic congregation. It also played a vital role in the lives of non-Catholic residents who sent their children to St. Loreto’s school. Robertson grew up in Brownsville’s Glenmore Plaza, which was then a Mitchell-Lama development. Glenmore Plaza switched to New York City Housing Authority (NYCHA) management in the 1970s, she said. Up until the mid-1990s, many neighborhood children attended the school. “Parents who could afford it felt it was a better education,” she said. Our Lady of Loreto’s school building was demolished in 2007. How are the paintings holding up? Fast-forward to the present. Toglia, the researcher, is worried about conditions inside the church, which officially closed in 2009. “We don’t know how much deterioration could be going on,” he said. He wonders how magnificent religious paintings by Italian-born artist Gaetano Capone Jr. are holding up. Catholic Charities Progress of Peoples Development Corp. (POP) originally planned to tear down the church building and Our Lady of Loreto’s rectory and construct 88 units of low-income housing. Amid outcry protesting the planned demolition, the state preservation agency determined the church complex was eligible for listing on the State and National Registers of Historic Places. In October 2010, the state Office of Parks, Recreation and Historic Preservation signed a letter of resolution, as did three government housing agencies and POP, stipulating that the church building should not be torn down. Its survival was to be the “primary mitigation” for the “adverse impact” caused by the rectory’s demolition. And the size of the housing complex was trimmed to 64 units. In 2013, POP and its development partners completed the construction of Catholic Charities Monsignor Anthony J. Barretta Apartments. Its addresses are 2354-2358 and 2372-2374 Atlantic Ave. and 2353-2365 Pacific St.